For many, the name of Adolf Eichmann is synonymous with the Nazi murder of six million Jews. As a perpetuator of the Final Solution he stands alongside Adolf Hitler and Heinrich Himmler as one of history's most notorious murderers, yet ever since Hannah Arendt's seminal book, Eichmann in Jerusalem: A Report on the Banality of Evil, there has been disagreement about the essence of Eichmann and by extension, about the definition of evil action. Was he a human monster or a petty bureaucrat? To what degree did the totalitarian organization to which he belonged absolve him and his staff from individual choice and responsibility for atrocities? 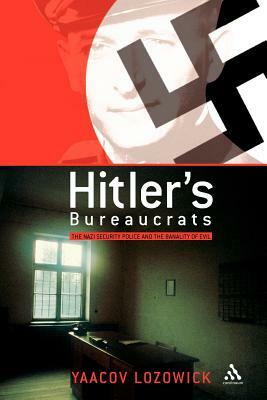 This title looks at the words and actions of Eichmann and the bureaucrats he worked with in Berlin and throughout the more significant Gestapo offices in Western Europe. It claims that Hannah Arendt's thesis about the banality of evil was wrong. In chilling detail, it presents a group of people completely aware of what they were doing, people with high ideological motivation, people of initiative and dexterity who contributed far beyond what was necessary. While most of these bureaucrats sat behind desks rather than behind machine guns, there was nothing banal about the role they played in the destruction of European Jewry. Yaacov Lozowick is the director of the archives at Yad Vashem, Israel's national authority for commemoration of the Holocaust. He has published articles in Hebrew, German, Polish, and English on the history of the SS, on the role of memory in Judaism, and on the pitfalls of Israeli-German dialogue. He lives with his wife and three children in Jerusalem.